I love the music that I release on Free Floating. While that may seem a banal statement, I feel that it’s important to put it out there. As the label has grown and I have clarified and developed my approach to the music that is submitted to Free Floating, I have come to feel more strongly the importance of my loving the music. While I can apply various aesthetic criteria to works that I am evaluating for release, much of the final decision comes down to how I feel about the music and how it makes me feel, qualities which often escape explanation. Works that reach that important pinnacle of immersive emotional engagement are what I aim for in Free Floating releases. And that brings me to Whispers Fall. 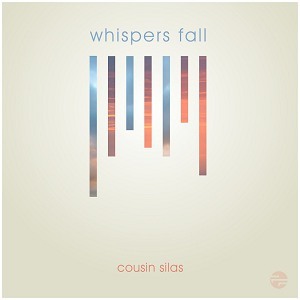 The music of Cousin Silas has popped in and out of my attention over the past couple of years. He has a voluminous catalog of releases that represent a variety of ambient styles and approaches. But I will admit that only a handful of releases struck a chord with me, many of them being more experimental and dark for my (admittedly narrow) tastes. So while I'm a fan of some of his Complex Silence releases, The Snow Imposed Silence, I wasn't sure what to expect when the tracks that make up Whispers Fall found their way to me. What I discovered was a gorgeous world of delicate ambient bliss. These tracks float delicately through some magical aural spaces, spaces that entrance and invite, yet with a subtlety and self-assured serenity. I am truly enamored of these tracks. They have floated throughout my house day and night. They have accompanied me to sleep on several occasions. I've only had them for a few months, but they feel like old friends. So my thanks to Dave (Cousin Silas) for creating this music and sending it my way. I feel confident that you will feel the same gratitude when you listen to Whispers Fall.